New Delhi, March 22: Two days after the Special NIA court allowed Enforcement Directorate to interrogate Altaaf Fantoosh – son-in-law of Separatist leader Syed Ali Shah Geelani – and two accused in the Kashmir terror funding case, the ED on Friday imposed a penalty of Rs 14.4 lakh on Geelani for illegally possessing foreign exchange of around $10,000. With the completion of the probe and adjudication proceeding, the officials of the ED issued an order under the Foreign Exchange Management Act (FEMA) on Wednesday and confiscated forex of $10,000 that was allegedly recovered from Geelani, reports PTI. Also, as a similar probe in underway against another separatist Yasin Malik – former Chairman of Jammu Kashmir Liberation Front. J&K Terror Funding Case: Special NIA Court Allows ED to Interrogate Altaaf Fantoosh, Others Lodged in Tihar Jail. 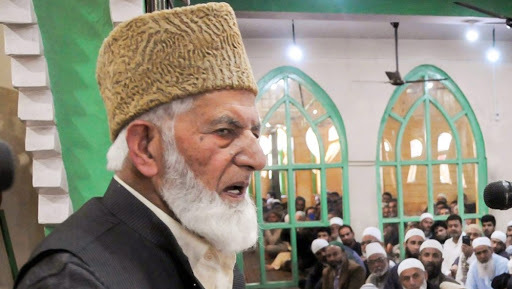 Earlier on Wednesday, the Special NIA court allowed Enforcement Directorate to interrogate Altaaf Fantoosh – son-in-law of Separatist leader Syed Ali Shah Geelani. Also, it is to be known that Hurriyat Conference chairman Mirwaiz Umar Farooq again refused to withstand his plea before the NIA, requesting the central agency to shift the ‘questioning’ procedure from Srinagar to Delhi. He said on Monday that he is willing to cooperate with the Agency in the matter, provided the venue for examination to be shifted from Delhi to Srinagar. He had expressed his apprehensions over his security concerns in the national capital, as most of the leaders who went to Delhi for summons were arrested.